Summer meals are salads mostly for us. While its not exactly summer in my country, it is so for most of the northern hemisphere. 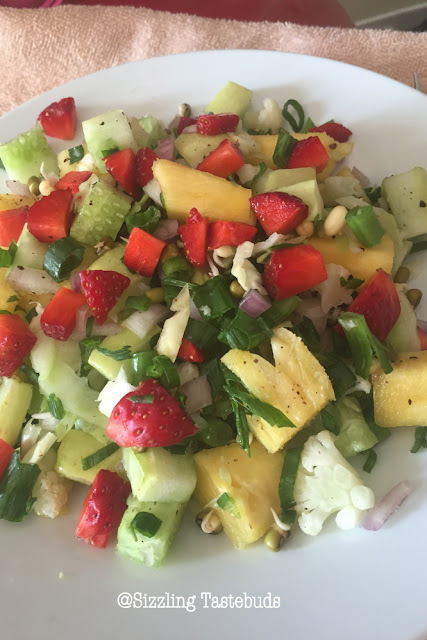 So, here is a quick salad thats apt for those potlucks / parties . With no slaving at the stove, this is a great make-ahead dish too. 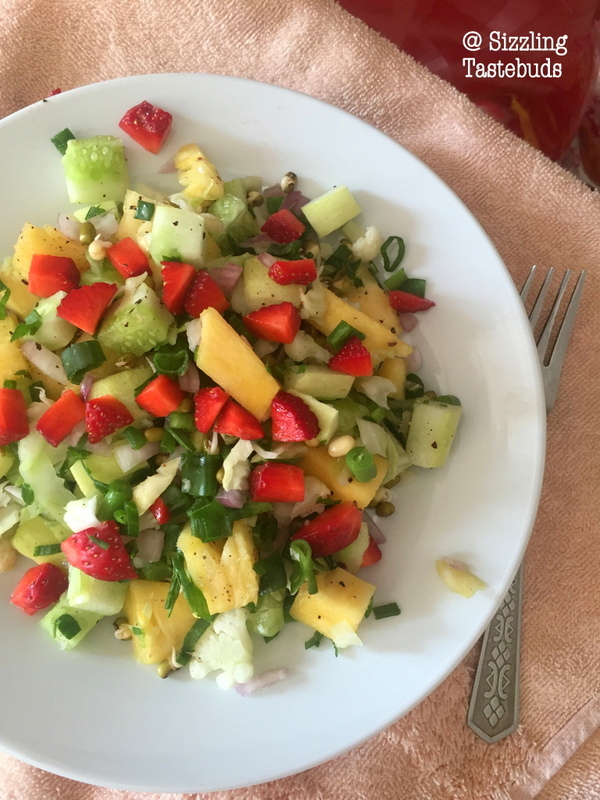 I adapted this from here, and substituted the protein (chicken) with moong sprouts (yes, I promise - next time it shall be a larger portion :)) We loved it a lot and sure to make it the next time we have ripe sweet pineapples which are a must for this salad. Funnily enough, my elder one who doesn't like pineapples dug into this salad. Its quite catchy on the eye with its vibrant colours and I particularly liked this salad for the addition of scallions and some other flavouring. In a large bowl, stir together lime juice, oil, salt and cumin until blended. Add pineapple chunks, cucumber, cilantro, onions, sprouts and scallions; toss to mix and coat. I like salads with lemon dressing , these are light and taste best . A colourful salad which would please me . That's my kind of salad, looks so delicious. I love fruits in my salad. That is our fav lemon dressing too. Vibrant salad for sure. Delicious and colourful. Love the lemon dressing on any salad. That's one crunchy my kind of salad. Simply love it. Such a gorgeous and very catchy salad, love anything with strawberries. Pineapple and Strawberry ,such a fusion of tropical flavours!! Pineapple and strawberry are both my favorite fruits. The salad is perfect to finish anytime.